Hi Techies, In this Post we will Discuss Micromax Canvas 5 Price in India, Specifications and Features. So Let’s Begin. The Micromax Canvas 5 is equipped by a 1.3 GHz Media-Tek Octa Core Processor, 3 GB Ram, 5.2 Inch Full H.D Display. This time Micromax has targeted the selfie lovers since it has a 5 MP Front camera with Flash & a 13 MP Rear Snapper with which you can shoot some decent quality pictures. In terms of performance, it is capable of handling most of the apps on play store with ease since it has 3 GB Ram which is above average compared to smartphones in this price range. 5.2 Inch Full H.D display. (~423 p.p.i pixel density). Comes with Picture-in-Picture feature i.e. you can take pictures from front as well as rear camera simultaneously. Apps can be directly launched even when the screen is locked using Smart Wake Gesture. CPU/GPU 1.3 GHz Octa Core Media-Tek MT 6753. | GPU Mali T-720 MP-3. DISPLAY 5.2 Inch Full H.D. Resolution 1080 x 1920 pixels (~423 p.p.i pixel density). CAMERA REAR 13 MP. Resolution 4128 x 3096 pixels, Auto focus with LED flash. | Features: Touch focus, face detection, panorama, H.D.R, Geo- tagging. | Video Features: 1080 p@ 30 fps. 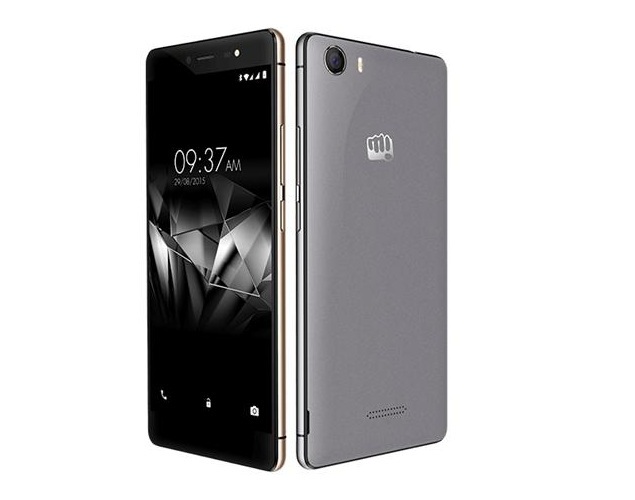 | FRONT/SELFIE CAMERA 5 MP With L.E.D Flash. NETWORK 2 G/3 G/4 G L.T.E Cat 4 (up to 150 Mbps download & 50 Mbps Upload speed) Support. BATTERY Non-removable Li-Ion 2900 m.Ah. FEATURES Corning Gorilla Glass 3 Protection. | Full H.D Display. | Octa Core CPU. | 3 GB Ram. | 4 G Support. CONNECTIVITY Bluetooth v 4.0. | W.I-F.I 802.11 b/g/n. | Hot Spot. | Dual SIM (G.S.M). (SIM-1 4 G (Micro S.I.M.) | SIM-2 3 G (Micro S.I.M)). The Micromax Canvas 5 is now launched in India for a price tag of 11,999 Rupees & It will go on sale soon. Stay Tuned for more Tech Updates and Don’t Forget to Join Us on Facebook.